After Cheetah and Mili had sniffed and (almost) scratched this pullover to their liking, I took the blocked, folded and clean sweater to its rightful place in the sweaters drawer. This drawer has 9 hand knitted sweaters, 3 linen/cotton tops, and one ultra shabby, dog-haired, soft and warm cardigan. The cardigan gets raised eyebrows and surprised smiles from people..it just doesnt look right in that collection. For me, however, its been a lesson in learning how to knit for myself, to take note of my requirements, and to figure out exactly what I need for living with extreme cold and an extremely loving quartet of hairy dogs. The colour, dark blue, shows up every dog hair..the yarn, this lovely product from Brooklyn Tweed, is delicate and warm but not appropriate for ripping and re-knitting. The pattern, this one, had a very wide neckline, which completely defeated the purpose of keeping me well covered. The cardigan had been an excellent teacher…However, for this Fair Isle pullover, the Gurus emerged from books and blogs. It began with trying to figure out the technique of helical stripes. These stripes just go round and round, in which the mandatory bump or hump at the beginning of a row, is eliminated. I started with a small tube, and by the time I had a good Eureka moment, a sleeve was being completed. 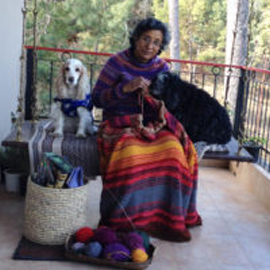 MasonDixon knitting, my go-to blog for entertainment, knitting, life skills and more. They are Gurus in every sense of the word. Then, the desire for gorgeous Fair Isle. This book has been instrumental in pushing me to try out something a little more challenging. A yoke with colour work, calculated reductions and no raglan sleeves, short rows and Kitchener stitch. Strange Brew had it all. It has been written by this pair of young mothers, who draw and plot, then knit and knit patterns. With the support of their husbands and immediate family, this intrepid duo packed their sweaters, kids, husbands and cameras and flew to Iceland for some photo-sessions. I will be knitting my way through the book, and the knitters are getting ready to knit colour work sweaters for sale. No project can be completed without some sane advice from Elizabeth Zimmerman. Her advice on hemlines resonates with me. I am not a fan of ribbed borders for every sweater. Cables, textural patterns and some jackets look good with a few inches of ribbing. Everything else can be given a breathless hemline. I use her instructions, reduce 10% stitches, use a thinner yarn and needles, and knit up a neat hem for some weight and style. EZ will always be the Ultimate Knitting Guru for me. So that, my dear readers, is the path taken this time. I am satisfied and delighted. Now, to wear this pullover day in and out, till Basant Panchami and warm winds arrive! Come rain, come hail…its Wednesday today! Delighted to discover your website! I look forward to reading your posts and seeing your photos.